Noting the increasingly unfavourable economic and operational position of nuclear power around the world, this paper reviews evidence for a hitherto neglected connection between international commitments to civil and military nuclear infrastructures. Reviewing well established understandings of interlinkages associated with fissile materials and other nuclear weapons related substances, the paper surveys a distinct – and currently potentially more important – kind of interdependency that has up to now received virtually no policy attention. This relates to the national industrial supply chains necessary for the manufacture and operation of nuclear propelled submarines, that are deemed central to strategic military doctrine in a few states – and to burgeoning ambitions in a number of others. One of the most striking features of these interdependencies, is that evidence is so strong in strategic military literatures, but that the issue is typically so neglected in energy policy analysis. So the repercussions extend beyond specific domains of civil and military nuclear policy making in themselves – significant as these may be. Across a range of countries, arguably the most important implications arise for the rigour and transparency of mainstream academic and energy policy analysis and the quality and accountability of wider democratic processes – that are failing to give due attention to the evident force of these connections. With civil nuclear power now increasingly recognised to be growing obsolescent as a low carbon energy source, but key military capabilities evidently depending so strongly on its maintenance, a potentially important new window of opportunity may be opening up for robust measures to reduce global military nuclear threats. 1: The Odd Persistence of Nuclear Power Why is it that nuclear power is proving so surprisingly resistant in particular places around the world, to dramatically changing global energy market conditions and structures for electricity supply?1 Against a backdrop of stark decline in the worldwide nuclear industry as a whole, plans for plant life-extension and nuclear newbuild remain major areas of investment in a few specific countries.2 Intense attachments persist to projects like Hinkley Point C in the UK3 for instance, despite: a delay standing presently at more than a decade; costs multiplying fivefold over original estimates; a series of still-unresolved serious technical difficulties; and demands for escalating government financial concessions and guarantees4. Globally, a range of different commentaries show how the relatively small number of continuing nuclear programmes typically display a similar mix of severely deteriorating conditions and oddly dogged enthusiasm 5 . Other stated energy policy aims also favour renewables. Across different countries, these are typically domestic resources whose geographically-distributed nature helps avoid the particular vulnerabilities associated with concentrated sites and sources as well as insecure global fuel supply chains. 12 Amidst many complexities, renewables offer employment benefits generally greater than those of nuclear. 13 And capital intensity, large unit size and long lead times are also major financial downsides of established nuclear designs in current investment markets.14 Technologies with such strikingly cumulative comparative disadvantages as nuclear would be abandoned in most other sectors. Therefore, serious questions arise as to why the declared commitments of some governments (like those of the UK, USA, Russia, Saudi Arabia, Turkey and Iran) should remain so oddly intense around a nuclear option that under-performs so badly across so many energy policy criteria. 2: Neglected Military Dimensions of Nuclear Power In a diverse and complex world, there are obviously many factors at work. In policy imaginations, organisational attitudes and elite cultures as well as infrastructures, the importance of sheer momentum and inertia should never be underestimated. 21 Although now increasingly replaced by the iconic status of other areas of innovation (like machine intelligence, synthetic biology, neuroscience and nanotechnology) one possible reason for the persistence of nuclear power in particular settings may relate to a residual effect of the past image of nuclear expertise as an epitome of scientific and technological prowess – and so a symbol of national standing. 22 And it must also be acknowledged that under some legitimate political perspectives, a few of the general strategic disadvantages discussed here around nuclear power are less acute in specific geographical settings. But the overall picture is so stark, that there do remain good grounds for asking what other influences might be in play, to help maintain such entrenched support for an energy technology that is, in so many respects, increasingly superseded. There are, around the world, then, many major connections between civil and military nuclear industrial capabilities, skills, expertise and infrastructures. Yet when taken together, these joint civil-military nuclear specialisms are in their turn, in many ways arguably unusually restricted in their general interconnectedness throughout the economy.33 Dependencies between civil and military nuclear are often greater than between nuclear-specific engineering and other industrial sectors. So, if civilian nuclear power and its associated specialist practices are to be allowed (like many earlier technologies) to go obsolete, then – with more net employment typically available in proportion to investment by other means 34– it seems that the only significant losers would be the nuclear establishments of a small number of countries that maintain military nuclear ambitions. Conversely, for those hoping for long-stalled reversal in either horizontal or vertical nuclear weapons proliferation35, it is possible that obsolescence of civil nuclear power as an energy source forms a potentially major– but under-considered – global opportunity. 3: Broad Patterns in National Civil and Military Nuclear Ambitions In all states with current and past nuclear weapons capabilities, parallel availability of the skills and industrial and research capacities now associated with civil nuclear power have been essential.36 The revenues arising from nuclear electricity sales have also been important, as part of these flow indirectly into supply chains and research, training and industrial systems that have joint civil and military applications.37 Some states (notably Israel and North Korea) have built modest military nuclear capabilities without directly pursuing civil nuclear power. But even here, existence of wider international nuclear industries (especially in sponsoring powers) has remained crucial.38 More broadly in current global nuclear politics, it is generally recognized that the intensity and nature of many national nuclear programmes is best understood by reference to ambitions to establish industrial capacities, by means of which future acquisition of military nuclear capabilities would be relatively easy. One rough circumstantial reflection of these evident general civil-military nuclear connections can be seen in the coarse-grain structure of resonating nuclear and military enthusiasms around the world today. Figure 1 below [ on original] illuminates broad overlapping patterns across all relevant countries, between general military standing, nuclear weapons status, nuclear submarine capabilities, global geopolitical profile and the intensity of declared civil nuclear ambitions (as expressed in data published by the leading nuclear industrial advocacy organization). Albeit circumstantial, it is quite obvious that it tends to be the leading global military powers who are also the leaders in civil nuclear power around the world – and the most committed to large scale new nuclear build. There is no global or regional military power, that has not displayed at least some active history of strong strategic pressures to pursue civil nuclear power capabilities. Conversely, no country with a current nuclear moratorium or that is phasing out nuclear power has either nuclear weapons, nuclear submarines or plans to develop either. Thus, the most recent major UK energy policy initiative that was not subject to this kind of general formal skepticism goes back even further, to 2003. And, based on a far more comprehensive analysis66, the conclusion of this last fully-considered UK Government energy white paper was that nuclear power is “unattractive”.67 Openly unwelcome to the then Prime Minister Tony Blair68 (but for reasons that were undeclared), it was this finding that was over-ridden by the cursory white paper of 2008 in a process acknowledged by Parliamentarians69 and nuclear proponents 70 alike, to have been extraordinarily secretive. And despite the market conditions becoming even less favorable, it is this under-substantiated positive official characterization of nuclear power that persists to this day. These civil-military links are also highly visible in UK industrial strategy, with priority given to a nuclear ‘sector deal’ spanning both sectors together77 and with many new agencies and programmes openly dedicated to achieving synergies between UK submarine and civil nuclear programmes. The nuclear sector deal is particularly focused on facilitating ‘mobility’ between the civil and defense nuclear workforce as a key strategy to manage the skills challenge. It is stated in “The Nuclear Sector Deal”78 that “the sector is committed to increasing the opportunities for transferability between civil and defense industries and generally increasing mobility to ensure resources are positioned at required locations” and that 18 percent of projected skills gaps can be met by ‘transferability and mobility’. The document also states that the skills gap can be met through “greater alignment of the civil and defense sectors with increased proactive two-way transfer of people and knowledge. As the military service sector tends to be age and nationality limited, we propose that we actively seek a recognisable career pathway between the civil and sectors to ease transfer between the two”. It is these remarkable conjunctions that have helped lead to reports in the UK90 and international91 press, that what is underway in the UK is, in effect, an unacknowledged cross-subsidy (amounting at least to several tens of billions of pounds)92 away from electricity consumers and to the benefit of military nuclear interests. Whatever the actual figures may prove to be amidst many complexities and uncertainties, the prima facie evidence seems clear that future UK electricity prices are being raised significantly higher than would otherwise be the case, at least partly in order indirectly to support military nuclear infrastructures by enabling a flow of resources into joint civil-military nuclear engineering supply chains and wider shared provisions for nuclear skills, research, design and regulation. The attraction of this strategy for the UK Government appears to lie in the triple aim of: (1) finding a means to cover the otherwise insupportable costs of this major military commitment; (2) whilst keeping the resulting expenditures away from inconvenient public scrutiny; and (3) entirely off the public books. But what is perhaps most remarkable, is that these evidently powerful pressures with apparently major impacts, remain entirely undiscussed anywhere in UK energy policy or related media debates. Despite the very high financial stakes, it is perhaps these implications for the rigour, transparency and accountability of UK democracy that are therefore most important. And where other countries–like those reviewed earlier–display similar dynamics, similarly serious implications evidently also arise elsewhere in the world. 5: Nuclear Power, Nuclear Weapons and Democracy Despite complexities, ambiguities and uncertainties – as well as constant change – the picture painted in this paper is quite striking. Based on a broad survey of the international scene (and with a particular focus on the UK), a diverse array of evidence has been summarised, that there exist continuing major links between deeply entrenched commitments in particular settings to civil and military nuclear technologies. A strong general association can be observed across different countries, between strategic military ambitions and the scale of stated plans for new nuclear power. In the USA, powerful imperatives have recently been openly declared in high level policy debate, to maintain support for otherwise-uncompetitive nuclear power in order to sustain a continuing nuclear navy. In the UK, evidence for the same links is strong on the military side, but virtually entirely absent in official energy policy documents or debate. Official audit procedures seem aware of these issues, but are circumspect about discussing them in public. And for their part, industry sources are clear about incentives to ‘mask’ these links. So, equally in terms of institutional processes, as well as energy outcomes, the economic and political stakes are clearly very high. Nuclear power is a controversial and expensive technology with a number of adverse wider characteristics, that is increasingly recognized to be growing obsolete by comparison with competing low-carbon energy technologies, yet which continues to receive oddly intense (and very expensive) continuing strong government support in several places around the world. The reasons for this are seriously under-documented and under-scrutinized in energy policy arenas. But it is relatively clear in policy debates that civil and military commitments are interlinked. Given the volume, depth and ostensible rigour of detailed energy analysis around the world, this substantive gap in discussion is quite remarkable. That so much of the picture has to be indirectly inferred – rather than being openly queried and analysed in policy documents – adds to, rather than detracts from, the gravity of the issue. It is especially notable that official energy policy discussions should be so silent on these issues, in countries like the UK, which pride themselves on robust policy procedures and vigorous democratic debate. 93 It took more than a year from the first coverage in major newspapers in other countries, for the topic even to be raised in a UK broadsheet (in two major pieces in the Guardian). Yet, despite the strong qualitative evidence reviewed in this paper, analysis of interdependencies, cross-subsidization and strategic complementarities between civil nuclear power and the military sector (especially the nuclear submarine industries), remains undiscussed beyond the work of the present authors – with even the asking of questions being dismissed by other energy researchers as a ‘conspiracy theory’.94 Firm quantitative evidence for the scale of such interdepencies does indeed remain lacking. But this is because necessary disaggregated information on flows of revenue, capital, employment and skill are not in the public domain. It may be that the gravity of these political implications – and fear of ‘conspiracy theory’ accusations – may in themselves be helping to inhibit due attention. So the undermining effects of these pressures on democratic debate are among the most serious potential impacts of the continuing policy and media inertia on these questions. In the end, however, the issues raised in this analysis are quite straightforward. To whatever degree, there can be little doubt that the increasingly precarious global status of civil nuclear power, is presenting a growing problem for the small minority of the world’s countries who wish to pursue military nuclear ambitions. Yet the secretive nature of the forces at work, is evidently helping prevent definitive conclusions over the scale of the associated impacts on military or energy strategies. 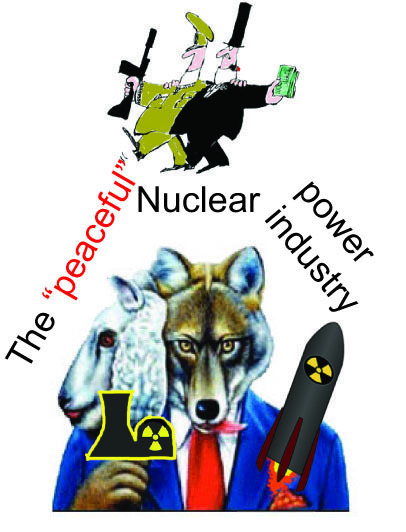 What is urgently required in order to resolve this picture more clearly, then, is the publication of currently missing crucial data concerning the nature and scale of the flows and interdependencies between civil and military nuclear industries, and a rigourous process of scrutiny involving probing interrogation, dedicated research and robust analysis. A series of questions remain open. To what extent are current continuing commitments to nuclear power, in particular countries around the world, due to national attachments to parallel military nuclear infrastructures? What is the magnitude of public provision for a shared civil and military strategic base in education, skills, research and key industrial and supply-chain capabilities? How much of the costs of these shared underpinnings for military nuclear ambitions, are being concealed by otherwise uneconomic joint civil-military nuclear infrastructures? How much cheaper might low carbon electricity services be to consumers, if these military pressures for nuclear lock-in were removed, easing a shift to more affordable energy efficiency and renewable energy? And if this lock-in is escaped, what opportunities are presented by the current demise of nuclear power, towards also reducing global exposures to military nuclear threats? It is remarkable that queries like these have for so long remained so unattended to in worldwide energy debates.95 For answers to be so lacking – and even the questioning itself to be so muted – is arguably one of the most serious legacies of the uniquely-shared infrastructures, institutions and cultures of civil and military nuclear technologies. What seems at stake is not just the future of these interlinked energy and security strategies, but arguably the health of democracies themselves.